San Diego Surf Photos - Your local professional surf photography service, capturing your best surfing moments at beaches in & around San Diego County. We offer personal surf photos shoots, and public photo sessions daily with all images available to view & purchase online. Surf photos of you at your local beach in San Diego County, California. 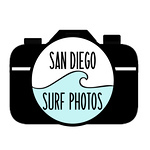 Follow San Diego Surf Photos for our latest local photo shoots, surf pics of you, great photos, special offers and more!